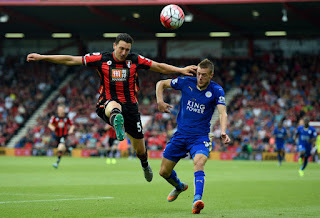 Leicester City welcomes Bournemouth at King Power Stadium on Saturday 3rd March . Leicester City are searching today for their first Premier League win in five game,as Four points separate Leicester and Bournemouth in the Premier League table. Foxes are sit in 8th with 36 points, while the Cherries are sit in 11th in the Premier League table with 32 points , both teams hoping to pick up three points and get further from the relegation zone. Leicester City XI: Schmeichel, Amartey, Morgan (c), Maguire, Fuchs, Ndidi, Silva, James, Mahrez, Albrighton, Vardy. Leicester have been disappointing over their last four games, picking up only two points. The Foxes lost to Everton and Manchester City and settled for draws with relegation zone clubs Swansea and Stoke at home,While Bournemouth have lost only once since Boxing Day, picking up 16 points in their last nine games. City's recent struggles to get the better of defensive-minded sides have prevented them taking the lead in the race to be the best of the rest. No Comment to " Leicester City v Bournemouth live stream info "